If you own a lot of jewelry or you pride yourself on keeping all your possessions sanitized and clean, then it’s well worth owning an ultrasonic jewelry cleaner. Not only can an jewelry cleaner take care of jewelry – making sure it’s sparkling and clean, but it can ensure dentures, brushes, coins, watches, and more, are all clean as well. 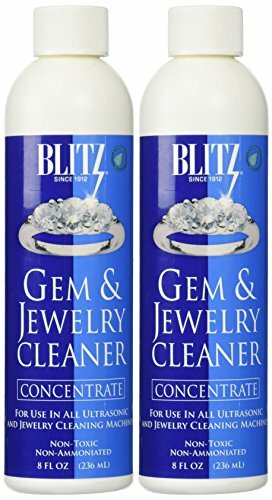 The sky’s the limit for what a new jewelry cleaner can do. However, when you take a look online and see the variety on offer, it’s clear to see it won’t be a smooth shopping experience. There are too many options! You can, however, narrow them down to a few by doing your due diligence. Find out what the tank capacity is, the cleaning cycle options, and what you can use them for. Pay attention to the warranty and price as well. All these can help you to choose an ultrasonic jewelry cleaner that’s fit for purpose and won’t disappoint. Are you ready to go shopping? We have included nine high-quality ultrasonic jewelry cleaners below – all of which are suitable for a range of tasks. You can use them for taking care of jewelry, cleaning your spectacles, dentures, and even grandpa’s old watch. Make sure always to read the care and use instructions and use as intended. What’s more, never attempt to wash jewelry or other items with porous stones such as pearls and emeralds. When you wear jewelry every day, it’s not uncommon to decide that you might need an ultrasonic jewelry cleaner. After all, when you expose it to different environments every day, it’s going to get dirty over time. Rather than waste time with a cloth and elbow grease, you can use an ultrasonic jewelry cleaner unit to get rid of dirt, oil, and grime, and give it that beautiful sparkling shine like it was when you bought it. When you decide to purchase one, set your sights on this one from Ukoke. Even though you pay a minimal amount of money for it, you get unbeatable value. It’s an all-purpose cleaner in either 0.6-liter or 2.5-liter capacities, and you can buy it in either green or silver as well. 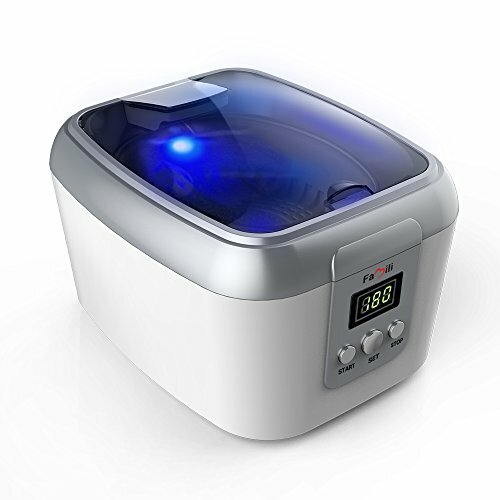 This ultrasonic jewelry cleaner is also suitable for more than jewelry as well. Its five cleaning cycles and timer make it more than ideal for spectacles, dentures, coins, clocks, watches, and more. Essentially, any small intricate metal items can benefit from a cycle in an ultrasonic jewelry cleaner. Sealing the deal is the high-quality degassing function, touch controls, 42,000 Hz sound waves for a better cleaning result, and the one-year warranty. 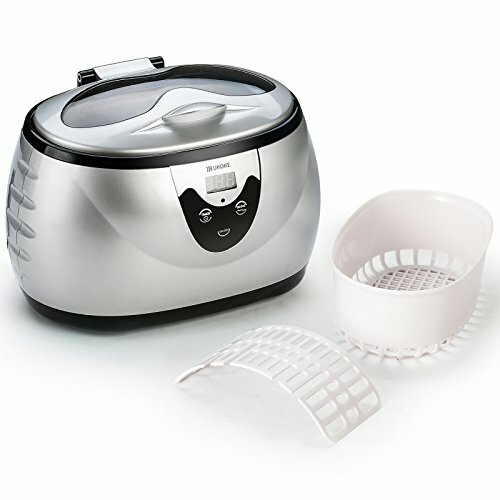 You will not be disappointed when you purchase this ultrasonic jewelry cleaner. Cleaning jewelry can take the average person a long time, but if you purchase an ultrasonic jewelry cleaner, it will no longer be a drag. Rather than slave away with a cloth and brush, you can let this ultrasonic jewelry cleaner do all the hard work. Using 42,000 Hz of ultrasonic waves, this cleaner works to clean built-up dirt, grease, and grime from all manner of items. You can put your jewelry in it, glasses, watches, silver, and even kitchen utensils and hygiene products like brushes and combs. While it’s an ultrasonic jewelry cleaner first, it’s a jack of all trades second. However, the benefits don’t end there. This cleaner is suitable for professional and home use due to its 20-ounce tank and robust plastic construction. It weighs 2.2 pounds, plugs directly into AC power, and offers five cleaning cycles and a one-year warranty. Whether you’re cleaning your toothbrush or your grandpa’s watch, you will find this ultrasonic jewelry cleaner can do it all. 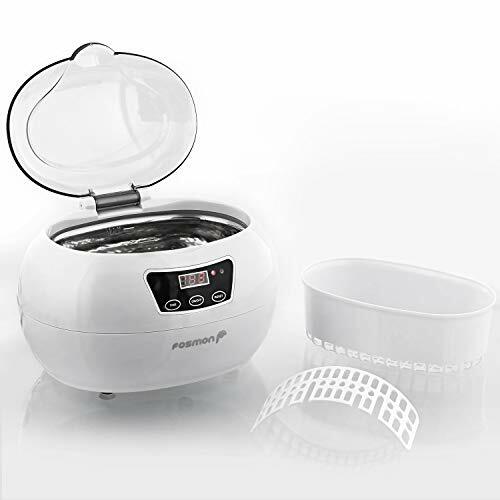 If your jewelry has seen better days, or it’s tarnished, dirty, or grimy, then why not purchase this ultrasonic jewelry cleaner from Famili? Even though you don’t pay very much to buy it, you can expect to be entirely happy with your purchase. This ultrasonic jewelry cleaner will meet the mark in more ways than one. Firstly, it uses 42,000 Hz ultrasonic sound waves to deliver a cleaning experience like no other. With five pre-set cleaning cycles, it’s also custom to what you want to clean. And, what you can clean is a lot! From glasses and dentures through to CDs, DVDs, jewelry, and coins, it can make anything sparkle! While you don’t get a full list of “do and do not” in the instructions, you can work it out through trial and error what this ultrasonic jewelry cleaner is suitable for and isn’t. Furthermore, you are going to enjoy the generously sized tank of 20.3 ounces, the digital timer to set the cycles, and the one-year warranty that comes with it. There’s everything to love about this ultrasonic jewelry cleaner. You have to lift up the whole unit to pour the water. If you don’t have a lot of jewelry or items you need to clean, but you still wouldn’t mind owning something that can do the job, set your sights on this Coil Master ultrasonic jewelry cleaner. Even though it’s only powerful enough to take care of small pieces, it’s going to meet the mark for a range of items. You can use it to clean metal, glass, jewelry, and even watches and coins as well. What’s more, thanks to its generous 0.60-liter tank, it only takes three minutes to get the job done. There is far more on offer with this ultrasonic jewelry cleaner than meets the eye. It’s compact and lightweight at 2.45 pounds, has an automatic timer which shuts off after three minutes, and produces a sparkling and shiny result once the item comes out clean. You also only need to use tap water and benefit from a moisture-proof and anti-corrosive ultrasonic jewelry cleaner that will more than impress every time. 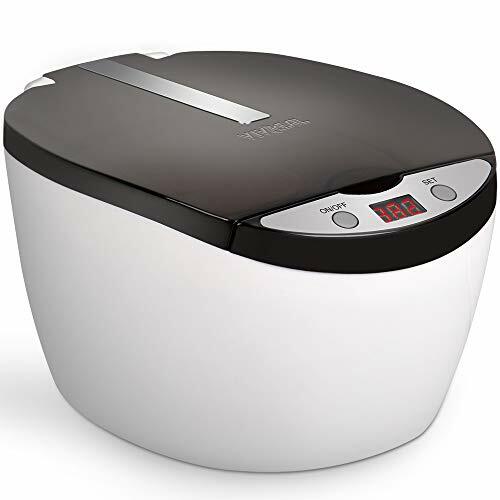 Whether you’re a professional or you have filthy jewelry, you will find this ultrasonic jewelry cleaner from Skymen will tick all the boxes for your needs. Even though you don’t pay a lot of money for this unit, you will be surprised at how effective it is. In fact, it’s ideal for if you own a dental clinic, mobile phone store, office, jewelry shop, eyeglass or clock shop, and more. When you need to clean any metal, glass, or similar item, this ultrasonic jewelry cleaner can be of assistance. 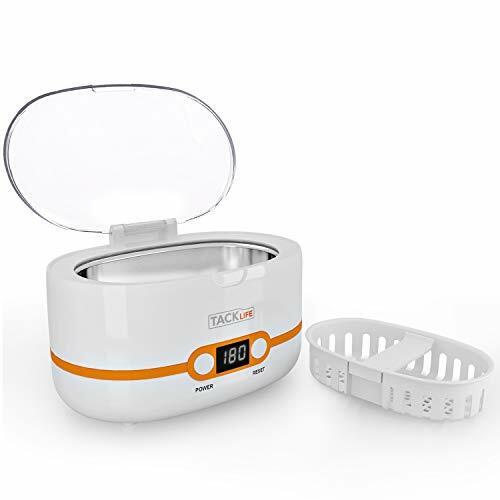 If you want a professional finish on your jewelry, metal, or glass, but you don’t want to pay professional prices, then take a closer look at this ultrasonic jewelry cleaner from Magnasonic. Even though it’s every bit the professional unit with high-quality features, you don’t have to spend the earth. 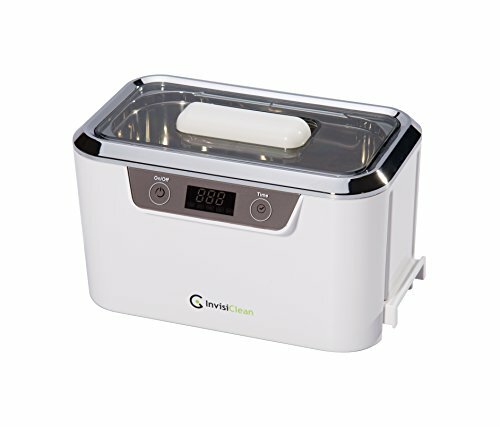 In fact, you can spend less buying this ultrasonic jewelry cleaner than you would having a jeweler clean your jewelry for you. What’s more, this ultrasonic jewelry cleaner can do so much more than that. You can use this 2.4-pound unit for taking care of metal, glass, tools, utensils, and more. 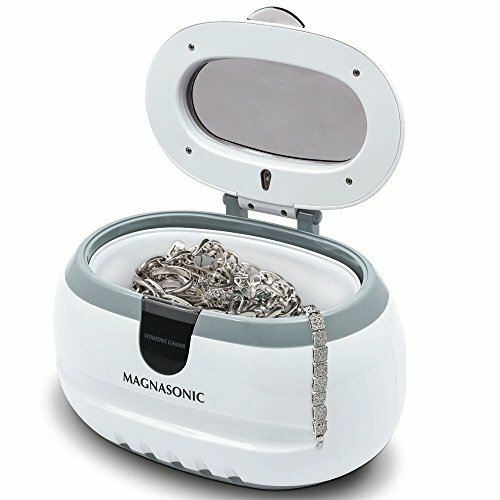 Anything you own that’s non-porous and is dirty, you can put in an ultrasonic jewelry cleaner from Magnasonic and have it coming out looking as good as new. It also offers a generous 850mL professional-size tank, a digital display, five cleaning cycles, and dual-wave technology. This technology enables small bubbles of water to get into crevices, cleaning out dirt. With professional results every time, you can put more money in your wallet and clean your jewelry yourself. 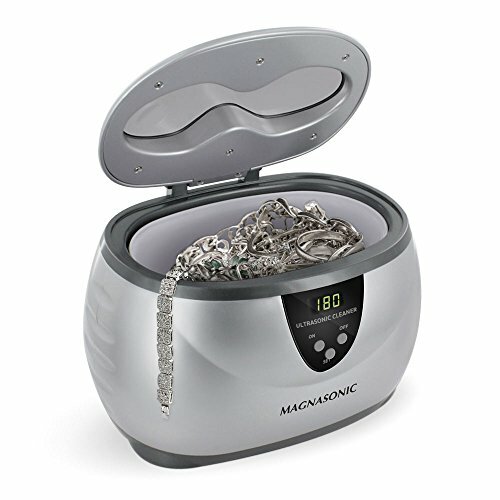 Invest in an ultrasonic jewelry cleaner from Magnasonic today. Almost every industry and every jewelry owner at some point will need an ultrasonic jewelry cleaner. However, rather than outsource the task to someone else who can charge the earth, why not buy your own and save a ton of money? Anyone can own and operate an ultrasonic jewelry cleaner; it just takes finding the right one first. When you come across this one from Skymen, you won’t have any qualms about hitting the buy now button. It features a sizeable 0.8-liter capacity tank, features robust stainless steel construction, and weighs only 2.82 pounds. What’s more, it offers five cleaning cycles for a range of items, and you can set the digital timer on it as well. Whether you’re a professional or homeowner looking for a professional finish, then set your sights on this high-quality ultrasonic jewelry cleaner from Skymen. Rather than keep handing over your hard-earned money to a jeweler for them to clean your treasured possessions, why not do the job yourself? You don’t need a professional jeweler to make your jewelry sparkling. All you need is an ultrasonic jewelry cleaner. You can then become the expert – using it for jewelry, metal, dentures, hygiene products, watches, spectacles, and so much more. There is very little you can’t use an ultrasonic jewelry cleaner for. However, it’s important to understand that not every cleaner you come across online is made the same. Some differ in quality, function, durability, and value for money. Before you add one to your shopping cart, make sure you do your due diligence. The last thing you want is to try one out and find it’s not fit for purpose. You can’t go wrong if you pay attention to these five points below. How much jewelry do you own? Or, how many items do you need to clean at any time? The tank capacity varies from one jewelry cleaner to the next – especially if you are using it at home or for business use. Therefore, you need to pay attention to the capacity. Most sit at around the 0.8-liter mark which is suitable for small amounts of jewelry. The effectiveness of the ultrasonic jewelry cleaner, of course, makes a significant difference. If it doesn’t clean your items thoroughly – either on its own or with the help of detergent, then what good is it to you? To determine the effectiveness of one you are looking at, read the reviews and check out the cycle options. Most beneficial ultrasonic jewelry cleaners on the market have plenty of cycle options from between 90 seconds and half an hour and have plenty of customers verifying how good it is. Most ultrasonic jewelry cleaners on the market are around the $30 mark. If you end up having to pay more, you need to find out why. What sets it apart from more affordable models? Is it the lifetime warranty, the larger tank, or the more effective clean? If it has no standout features, then there’s no reason why a more affordable model won’t meet the mark. Because ultrasonic jewelry cleaners are electronic devices that use water, there is a lot that can go wrong. And, while you don’t have to spend a lot of money to own one, it’s helpful to know you have cover for anything that goes wrong with it that’s not your fault. After all, it’s always disappointing when you buy something, it breaks, and you wasted your money. When the time comes to buy a new ultrasonic jewelry cleaner, check the warranty period. Most offer a one-year warranty, but there are others that provide two or more, or even up to a lifetime warranty. You may pay a little more for a better warranty, but it’s best to lose a few dollars than risk losing it all. The best thing about owning an ultrasonic jewelry cleaner is that its name is deceiving. While it’s true you can use it for cleaning jewelry, many of them can do so much more. Read the product description of the one you’re looking at before going ahead with the purchase. You may find that you can use it for coins, watches, clocks, jewelry, hygiene products such as brushes and combs, and even dentures. The instruction manual may also include a comprehensive list of what you can and can’t use in it.